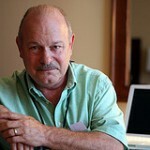 Joe William Haldeman (born June 9, 1943) is an American science fiction author. He is best known for his 1974 novel The Forever War. That novel, and other of his works including The Hemingway Hoax (1991) and Forever Peace (1997), have won major science fiction awards including the Hugo Award and Nebula Award. For his career writing science fiction and/or fantasy he is a SFWA Grand Master and since 2012 a member of the Science Fiction Hall of Fame. Many of Haldeman’s works, including his debut novel and The Forever War (his second) were inspired by his experience serving in the Vietnam War, where he was wounded in combat, and by his adjustment to civilian life after returning home. The Science Fiction Writers of America officers and past presidents selected Haldeman as the 27th SFWA Grand Master in 2009, and he received the corresponding Damon Knight Memorial Grand Master Award for lifetime achievement as a writer during Nebula Awards weekend in 2010. The Science Fiction Hall of Fame inducted him in June 2012. He has also won numerous annual awards for particular works. He is a lifetime member of the Science Fiction and Fantasy Writers of America (SFWA), and past-president.